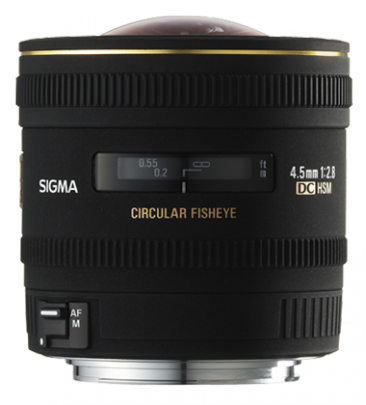 Sigma’s 4.5mm F2.8 EX DC Circular Fisheye HSM creates an image that is a circular, curved, distorted view of reality when used on a digital SLR camera. One of the most unusual lenses a photographer can use as it produces a circular image within a black surrounding frame. It is ideal for landscapes and panoramic photography. Because of its equisolid angle projection system, the lens can be used for scientific applications. The minimum focusing distance of 5.3 inches allows the photographer to have fun with placement of subjects extremely near to the camera with distorted backgrounds. SLD (Special Low Dispersion) glass employed for effective compensation of color aberration, Super Multi-Layer lens coating reduces flare and ghosting and assures high image quality throughout the entire focal range. In the hands of a photographer looking for creative expression and the opportunity to explore and create, this is the ultimate creative tool.